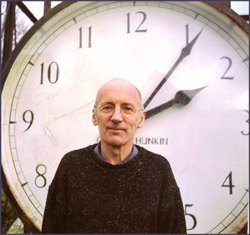 Tim Hunkin (b. 1950) was educated as engineer but became a cartoonist for The Observer’s Sunday magazine. He researched and drew a strip called The Rudiments of Wisdom for fourteen years. He has built coin-operated machines intermittently since he was a child. He had a show at the ICA in 1981 called The Disgusting Spectacle. Tim made three TV series that demystified everyday household and office machines for Channel 4, called The Secret Life of Machines (which can be downloaded here) They were shown all over the world via The Discovery Channel. In 1995 he completed a gallery for the Science museum called The Secret Life of the Home, and it remains one their most popular galleries today. Inspired by Sue Jackson’s example of Cabaret Mechanical Theatre in Covent Garden, Tim set up his own arcade on Southwold pier in 2001 called ‘The Under the pier show‘. He’s still completely obsessed about it today and builds new machines regularly – so much so, that he even had to expand to London. 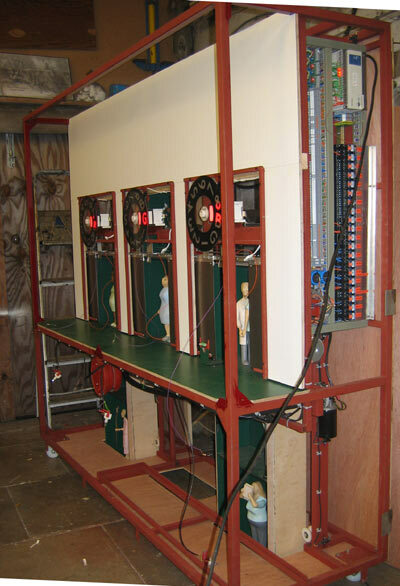 Many of these are low tech simulator rides, mixing video and physical mechanisms. 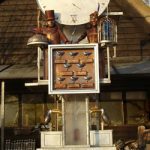 He takes on occasional commissions each winter, and one of these, a donations box for St Thomas’s hospital in London, is proper automata! 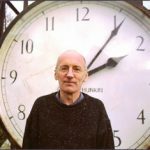 Tim has a large website which includes videos, essays and much, much more.